Handmade organic body butters which work hard to deeply moisturise your skin with organic shea and cocoa butter. 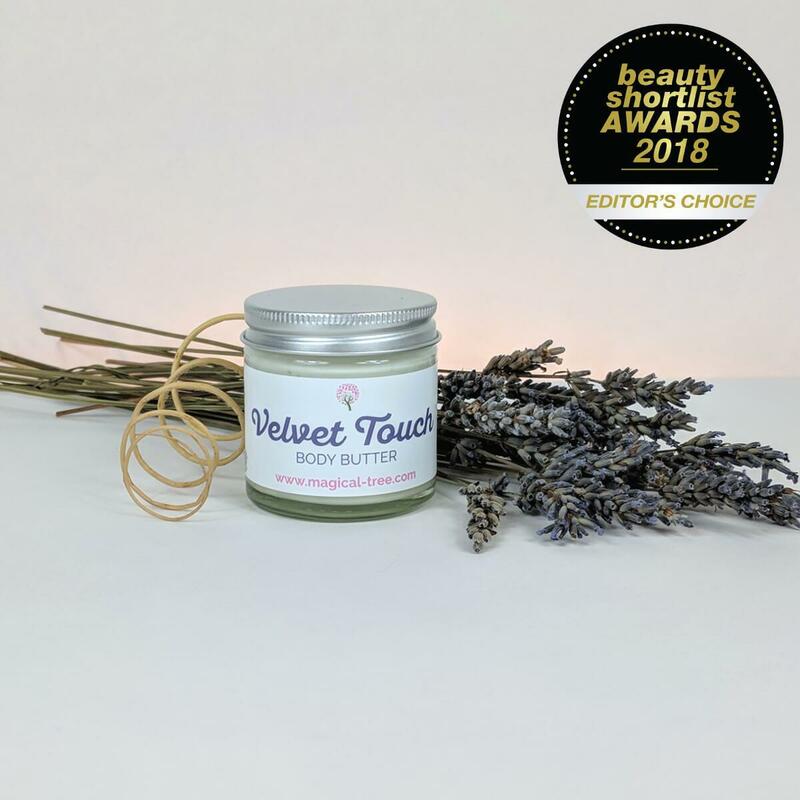 Velvet Touch - Award-winning nourishing combination of shea, cocoa and mango butter with grapeseed, coconut and sweet almond oil makes this body butter rich and soothing. Scented with lavender essential oil and with a hint of roman chamomile and sweet orange for a relaxing effect. Created with dry and oily skin in mind. 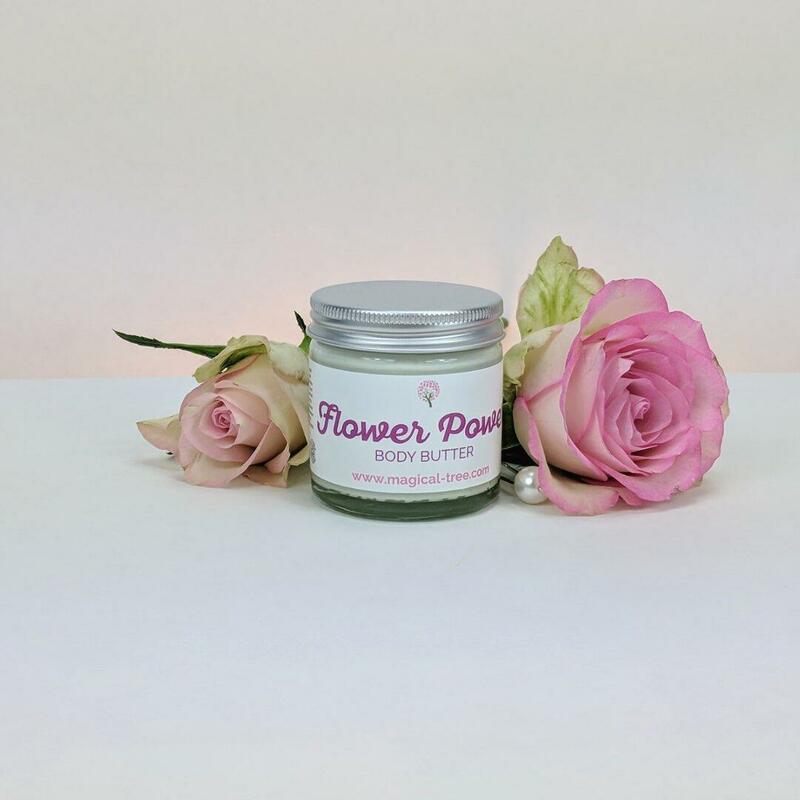 Flower Power (sweet and flowery scent) - This body butter contains a nourishing combination of shea, cocoa and mango butter with grapeseed, coconut and sweet almond oil. There is added Geranium Bourbon Essential Oil to to our body butter to make it fragranced and to awake the atmosphere of a sunny rose garden. 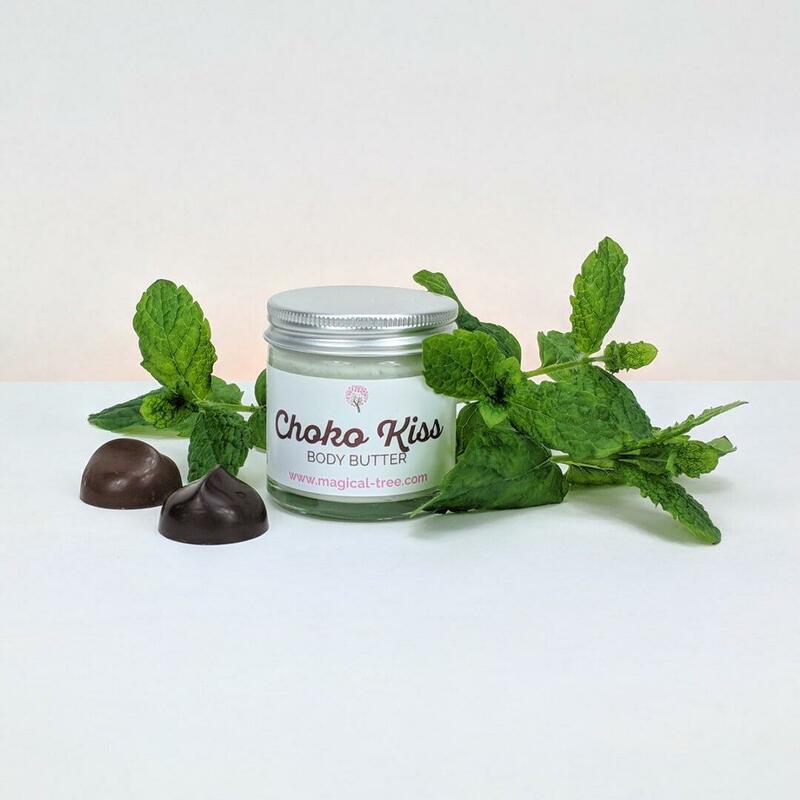 Choko Kiss (Cocoa & Peppermint) - Rich shea mango butter mixture with nourishing grapeseed, coconut and sweet almond oil. But we whipped a unrefined organic cocoa butter to it, for creating you a chocolate base scent. As an extra twist we added a hint of organic peppermint essential oil for an uplifting and fresh aroma. 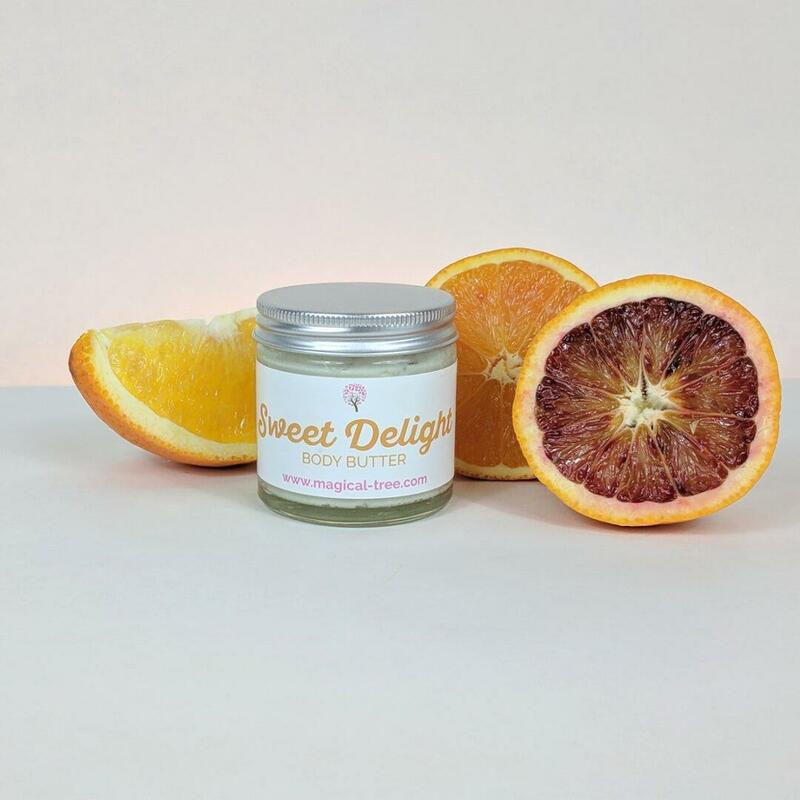 Sweet Delight (Orange & Grapefruit) - Nutrient dense body butter based on 100% natural butters and carrier oils and leaves your skin as soft as babies’ and coats it with sensational orange aroma. It is rich in healthy fatty acids, natural antioxidants and vitamin E to keep your skin healthy looking and soft. Directions of use - Use clean cosmetics spoon or washed hands and massage into hands, chest and neck. Velvet Touch - Butyrosperum parkii (shea) butter*, theobroma cacao (cocoa) seed butter*, mangifera indica (mango) seed butter, caprylic/capric triglyceride (coconut fractionated oil)*, vitis vinifera (grapeseed) seed oil*, prunus dulcis (sweet almond) kernel oil*, citrus aurantium dulcis (orange) peel oil*, lavandula angustifolia (lavender) leaf oil*, anthemis nobilis (chamomile) flower oil*, tocopherol (vitamin E), citral+, linalool+, limonene+, geraniol+, citronellol+. Flower Power - Ingredients - Butyrosperum parkii (shea) butter*, theobroma cacao (cocoa) seed butter*, mangifera indica (mango) seed butter, caprylic/capric triglyceride (coconut fractionated oil)*, vitis vinifera (grapeseed) seed oil*, prunus dulcis (sweet almond) kernel oil*, pelargonium graveolens (geranium bourbon) flower oil, citronellol+, tocopherol (vitamin E), geraniol+, linalol+, citral+. Choko Kiss - Butyrosperum parkii (shea) butter*, theobroma cacao (cocoa) seed butter*, mangifera indica (mango) seed butter, caprylic/capric triglyceride (coconut fractionated oil)*, vitis vinifera (grapeseed) seed oil*, prunus dulcis (sweet almond) kernel oil*, mentha piperita (peppermint) oil*, tocopherol (vitamin E), limonene+, citronellol+, linalol+, eugenol+. Sweet Delight - Butyrosperum parkii (shea) butter*, theobroma cacao (cocoa) seed butter*, cocos nucifera (coconut) oil*, caprylic/capric triglyceride (coconut fractionated oil)*, vitis vinifera (grapeseed) seed oil*, prunus dulcis (sweet almond) kernel oil*, citrus aurantium dulcis (orange) peel oil*, citrus grandis (grapefruit) peel oil*, tocopherol (vitamin E), limonene+, citral+, linalol+. + Natural component of the essential oil. Product Packaging - 60ml clear glass jar and aluminium lid (both recyclable). It is recommended to use a clean cosmetic spatula when taking out the butter from the pot or wash your hands before usage for prolonging the shelf life of the butter. Store in a cool dry place away from sunlight. External use only. Always perform a patch test 24 hours before use. If irritation develops discontinue to use. Do not use on damaged skin. 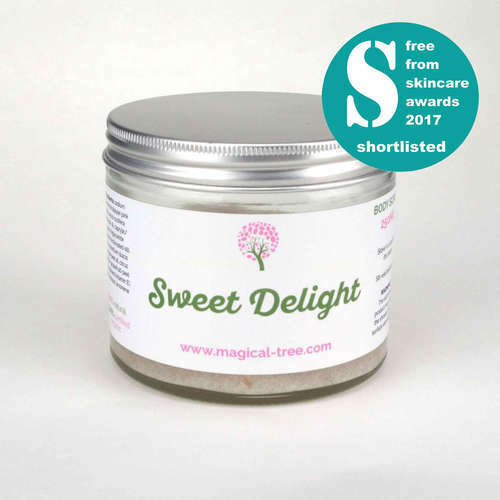 Magical Tree is run by Emmy and Laz and their mission is to make healthy skincare products and promote a lifestyle full of fairly traded organic products. Their natural beauty range is all handmade using simple, non-toxic ingredients, including 100% pure and natural oils, butters and pure essential oils and they use organic ingredients where possible. They have also been committed to reducing their impact on the environment and use glass jars/bottles and aluminium tins for their packaging. Delivery Packaging - Recyclable cardboard box and recyclable filling.